A quiet white steam exiting wet rubber tubes, headed for the product of his installation – a pink oyster mushroom, slowly growing from the carefully carved holes in the stainless steel constructions, surrounding us. We meet at Oskar Jakobsen’s studio in the Royal Danish Art Academy. It is a supreme mess. It is the exact opposite of the clinic creation hanging in one of the tall white rooms of the museum on the other side of the courtyard. The artwork Intelligo is Oskar Jakobsen’s visual representation of two topics that have been invading his thoughts for a long time now. The first one is data-in-fusion of DNA. Computer scientists at Columbia University recently succeeded in storing large amounts of data in DNA, and reading it again. Oskar Jakobsen pushes back a pile of notebooks, electronic devices, and tiny tools on his desk, and carefully puts down a hand full of his freshly harvested pink oyster mushrooms. He explains that the second thing this installation is rooted in, is tendencies such as body hacking and polyphasic sleeping. 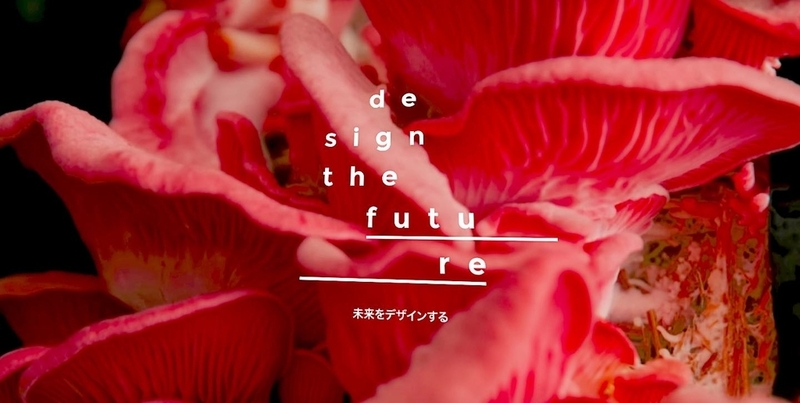 These topics are, what initiated the thought pattern behind Inteligo – an art installation that illustrates a data-infusion of great literature into the DNA of the pink oyster mushroom. When the mushroom is harvested, they are packed, and put into a refrigerator as part of the installation, with labels saying James Joyce Ulyses or E. H. Gombrich Story of Art. This is the physical representation of the idea, that we can actually eat and digest data-infused mushroom, and who knows, in some years maybe unzip the information with our body and store it in our brain, and thereby learn by eating. Oskar Jakobsen describes the initial phases of his work process, as rhizomatic thought patterns. Thoughts appear and when they have been haunting him for long enough, he simply can’t deny them. Over time, as he researches and begins giving form to his thoughts at his studio, two or more ideas that seem to have absolutely nothing in common begin touching. New connections slowly start to show themselves to him. If the connection strengthens, Oskar Jakobsen starts working hard on versions of a physical manifestation of what comes out of the touch of the topics. At some point the concept stands clear for itself as a new creation. A creation rising from the connections between seemingly unrelated phenomenons. We make sense of the world around us through the sensory inputs we perceive. Depending on what inputs make sense to us, we make interpretations of meaning and articulate our perception, thought and intentions in language and actions. Sensing is an essential faculty of what it means to be human. 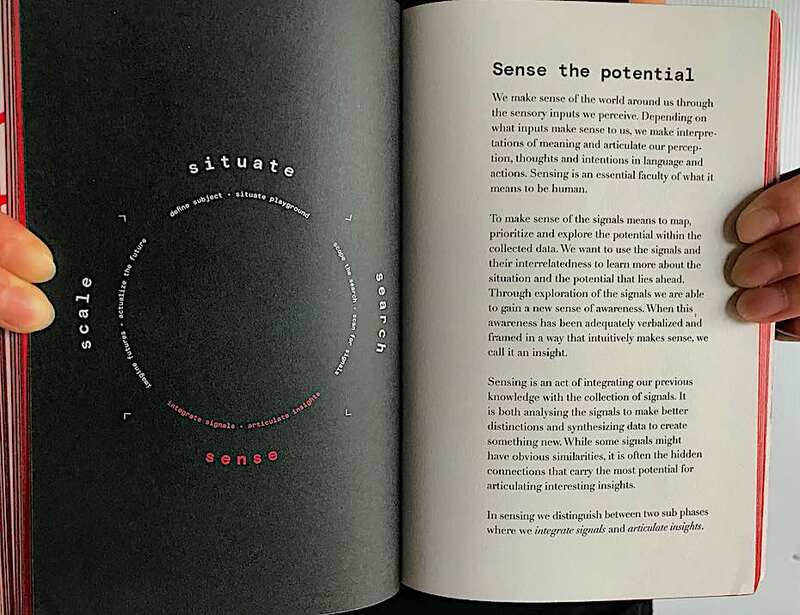 To make sense of the signals means to map, prioritize and explore the potential within the collected data. We want to use the signals and their interrelatedness to learn more about the situation and the potential that lies ahead. Through exploration of the signals we are able to gain a new sense of awareness. When this awareness has been adequately verbalized and framed in a way that intuitively makes sense, we call it an insight. 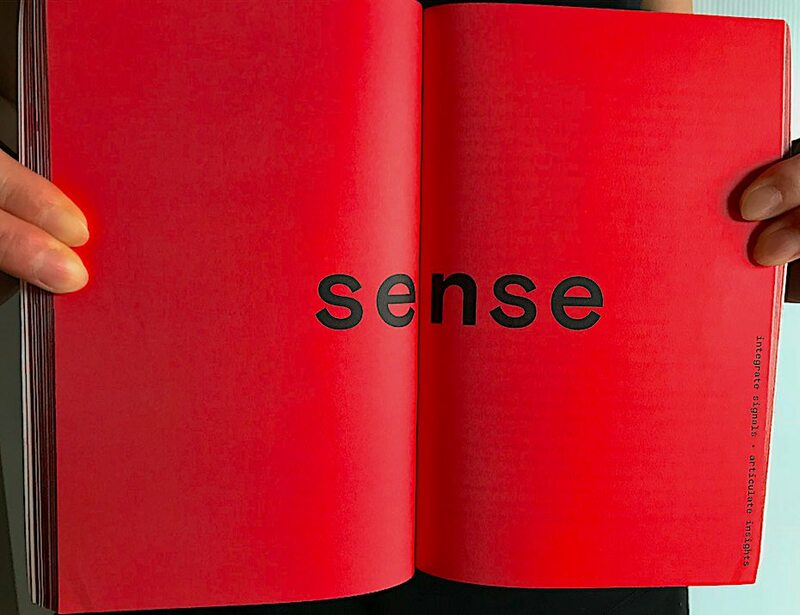 Sensing is an act of integrating our previous knowledge with the collection of signals. It is both analyzing the signals to make better distinctions and synthesizing data to create something new. While some signals might have obvious similarities, it is often the hidden connections that carry the most potential for articulating interesting insights. In sensing we distinguish between two sub phases where we integrate signals and articulate insights.